Avoid adding unnecessary "stress units" to high voltage circuit breakers. The Barrington Model CBS (Circuit Breaker Simulator) was designed to be a convenient, light weight alternative to operating high voltage circuit breakers while testing the operation of substation protection relays. Use the CBS to prove the trip and close operations while doing routine and commission testing of protective relay operations. 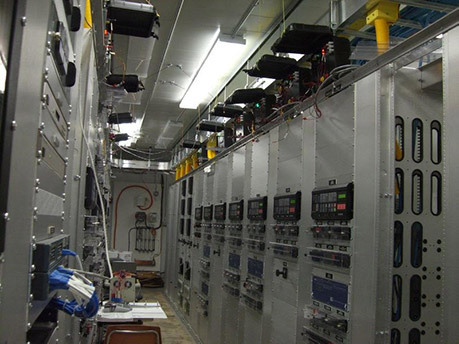 The Circuit Breaker Simulator operates on both 48VDC and 125VDC systems. Trip and Close connectors are provided for protective relay inputs. 6 Auxiliary contacts are provided for various test connections. 3 normally closed contacts and 3 normally open contacts are available. The Circuit Breaker simulator has built-in protection against accidental reverse polarity or misapplied source voltages. Manual close and trip micro-switch push-buttons are provided for user convenience. Indicating pilot lamps are 100,000 hour rated super bright LEDs. A BIG package and it only weighs 8.5 lbs. This is a picture of ten CBS units being used in a new substation control room to commission the relays prior to receiving the circuit breakers. Click here to download product manual for the CBS. Click here to request a quote/ net support/ more information for the CBS. © 1999-2018 Barrington Consultants, Inc.